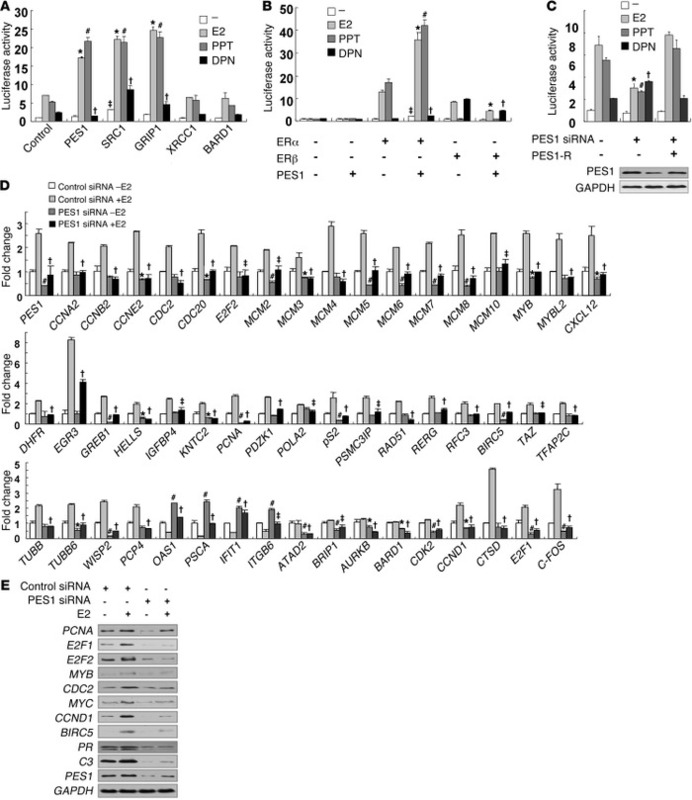 PES1 differentially regulates transcriptional activity of ERα and ERβ and expression of their target genes. (A and B) Luciferase reporter assays of ERα and ERβ transcriptional activity in (A) MCF7 or (B) SKBR3 cells transiently transfected with ERE-LUC and PES1, SRC1, GRIP1, XRCC1, or BARD1 with or without ERα or ERβ and 24-hour treatment with 10 nM E2, 1 nM PPT, or 1 nM DPN. Results shown are mean ± SD of 3 independent experiments. ‡P < 0.01, *P < 0.01, #P < 0.01, †P < 0.01 versus empty vector in the (A) absence or (B) presence of ERα or ERβ with vehicle (–), E2, PPT, and DPN, respectively. (C) Luciferase reporter assays in MCF7 cells stably transfected with PES1 siRNA or PES1 siRNA plus siRNA-resistant PES1 (PES1-R) and treated as above. Immunoblot analysis of PES1 expression is shown. Results shown are mean ± SD of 3 independent experiments. *P < 0.01, #P < 0.01, †P < 0.01 versus control siRNA with E2, PPT, and DPN, respectively. (D) Real-time RT-PCR analysis of 47 genes identified by cDNA microarray in our study and 4 genes identified in other studies (CCND1, CTSD, E2F1, and C-FOS) in PES1 knockdown MCF7 cells treated or not treated with E2 (+E2 or –E2, respectively) for 24 hours. Data shown are mean ± SD of triplicate measurements that have been repeated 3 times with similar results. *P < 0.05, #P < 0.01 versus control siRNA without E2. ‡P < 0.05, †P < 0.01 versus control siRNA with E2. (E) Immunoblot analysis of estrogen-responsive gene expression in PES1 knockdown MCF7 cells.